Sooner or later you or someone you know will need some form of long-term care. 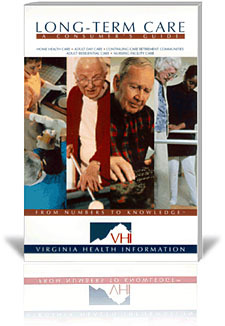 Virginia Health Information's LONG-TERM CARE: A CONSUMER'S GUIDE is a comprehensive publication to help them with the many issues facing those needing long-term care. You will find information on home care and community services, adult day care centers, continuing care retirement communities, and assisted living and nursing facilities. The LTC GUIDE assists the user in determining the most appropriate type of care for their needs as well as tools and information on choosing a specific care provider. A directory of resources helps you get assistance with financing, patients rights and private and government agencies.